My 1993 hiace 2.7 litre automatic, needs a new exhaust. I live in Watford in Hertfordshire uk. Does anyone know where I can source an exhaust system? The garage are having great difficulty finding one as apparently they are not made anymore. If you folks can help, I’d be very grateful. Maybe you could just go to one of these shops that makes exhausts on demand. Which part is it? Maybe you could get something from Japan but hard to find and then the shipping. Your garage are taking crazy pills. The exhaust is still made (as I've had parts of mine replaced in the past couple of years by my garage and I'm just over in Berkshire). Look up the part number on www.toyodiy.com and get them to have a look. I don't think they made a 1993 with the 2.7i petrol engine. So maybe you mean 2.8 diesel? 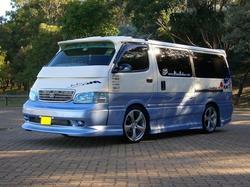 Or a 1996 onwards Granvia or Grand hiace or Regius with 2.7 petrol and automatic? Try your local Toyota dealer, they will look up the part and give you the price. The alternative is to go to a custom place and have them fabricate it, not sure which is cheapest. An official Toyota one will be pricey, there are motor-factor ones that come in a lot cheaper.